At some point in our lives we all like to think that we are rebels. Nonconformists who swim against the tide, march to the beat of a different drummer, do their own thing. The truth is of course far different. In reality, we all fall prey to the trappings of mass appeal. We may want to own a shack on the North Shore and wait for the right wave to surf, yet there we are in our cubicle during business hours. We mindlessly perform whatever task we do to pay our bills, while stealing a few moments occasionally to check social media to find out what everyone else is up to. How else can we explain the popularity of such things as the IPhone that people camp out to get, or a device that slips on our wrist but does nothing more than measure the steps we take each day, if not for people jumping on the bandwagon? The fact of the matter is people have been jumping on the bandwagon since before our predecessors wore hoop skirts and waxed their mustaches and we still are today. Most often we jump on the bandwagon and end up getting something we think we might actually need based on whatever else the rest of the world is buying; a nonconformist on the other hand will get what they want, or nothing at all, the masses be damned. This is never more true when looking at the automotive market. What appeals to many will usually appeal to the rest of us, because we need it. We may want a low-slung sportscar that growls like a tiger and explodes away from a stoplight like NASA launching a rocket. However, thanks to the fact that we are conforming to society, doing the adult thing, working, raising a family, we are forced to buy something that is more practical than fun. How else can one explain the popularity of the SUV? 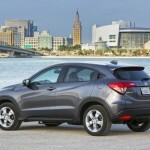 The SUV and its smaller cousin the crossover, are among the most popular vehicles on the road today. Most aren’t much fun, certainly don’t growl, but do the things that we need to conform to the rest of the world. We see these vehicles on the road and with little thought jump on the bandwagon eagerly fed by the auto manufacturers who crank out the higher profile vehicles with more storage than a car that we all seem to crave. There is an increasingly growing segment of this market. 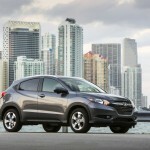 The subcompact crossover features vehicles smaller than the usual SUV and crossover offerings. 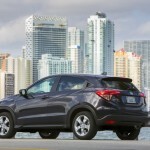 You get the benefits of an SUV, more cargo room and higher visibility, but the maneuverability, performance and fuel economy of a smaller car. 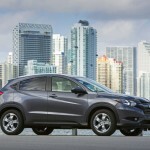 Think Chevy Trax, Nissan Juke, Jeep Renegade, Fiat 500X, and the latest entry, Honda’s HR-V.
A smaller version of the popular CR-V and Pilot, the HR-V makes its debut in North America for 2016. And we recently got to spend a week with it. 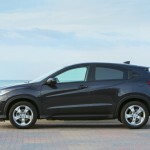 There was an earlier version of the HR-V (according to Honda the HR-V stands for Hi-rider Revolutionary Vehicle which sounds so Japanese),that was sold from 1999 to 2006 outside the US. 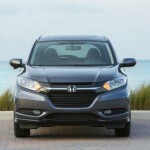 It was brought back for this year and is based on the third-generation Honda Fit. 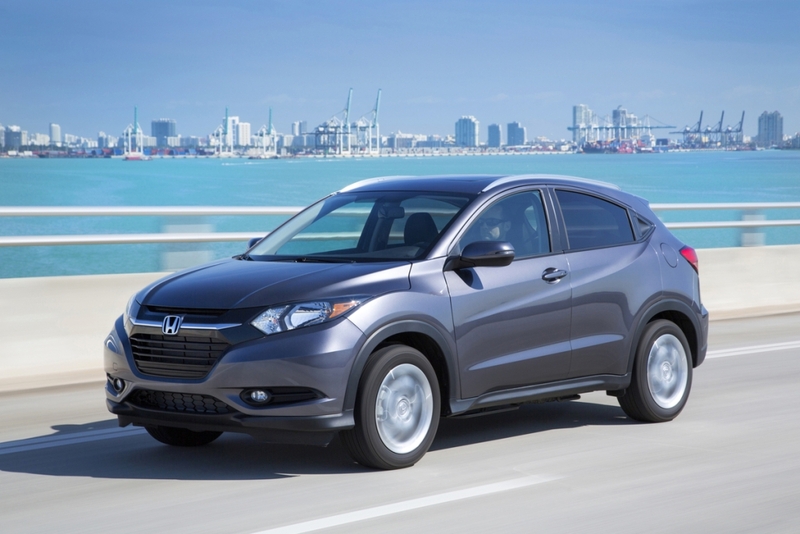 The 2016 Honda HR-V seats five and Is available in three trim levels: LX, EX and EX-L Navi. The LX is well equipped with full power accessories, cruise control, height adjustable driver’s seat, a 5-inch display screen, a rearview camera, Bluetooth phone and audio connectivity, and a four-speaker sound system with a CD player and a USB port. There is also a split 60/40 folding rear seat (Honda’s Magic Seat that folds up to expose the floorboard). Move up to the EX and you’ll get a sunroof, foglights, rear privacy glass, heated front seats, Honda’s “LaneWatch” which is a passenger side blind spot camera, automatic climate control, keyless ignition and entry a 7-inch touchscreen display, and a six-speaker sound system. The top of the line EX-L Navi, our tester for the week, adds leather upholstery, roof rails, an auto-dimming rearview mirror, satellite and HD radio and as the name hints, a navigation system. 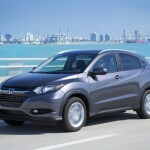 Under the hood, the HR-V gets a 1.8-liter four-cylinder engine putting out 141 horsepower and 127 pound-feet of torque. 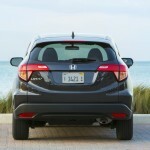 The HR-V is either front-wheel or all-wheel drive. The LX and EX can be had with a six speed manual, front-wheel drive only, while a continuously variable automatic transmission (CVT) is optional. The CVT is the standard transmission of the front-wheel drive EX-L Navi, and while all-wheel drive is available on all trims, the only transmission that can be had with the AWD is the CVT. 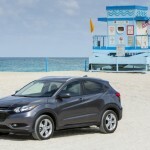 Unlike some the quirky looks of the others in this class, like the Juke and the 500X, the exterior styling on the HR-V is modern, sleek and stylish. The interior is nicely laid out with a nice sparseness and enough room for easy entry and exit and with gauges easy to read. The 7-inch touchscreen display handles more of the entertainment, navigation and communication functions and easy to use. The climate control is set via a touchscreen sort of set up on the center stack with the only real annoyance being the volume on the radio (that can be controlled via a button on the steering wheel). On the road the power is adequate but just. 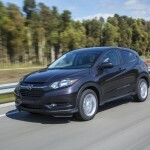 The CVT, like many others, seems to always be trying to catch up and going 0-60 in under 10 seconds would be a feat. 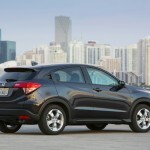 Beyond that however the 4-cylinder seems capable for everyday use. There is enough power for passing and the ride is relatively smooth and there is minimal body roll in aggressive cornering. 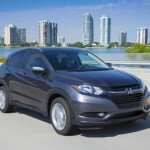 Having little experience with Honda’s in the past, we weren’t too sure what to expect. We were left impressed however, especially considering the price. Our top of the line tester maxed out with an MSRP of $26,720. 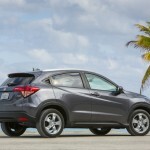 Very nice considering all the features packed into the HR-V and less than many others in this segment. 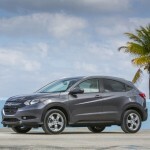 If you are going to conform, jump on the bandwagon and need a small crossover, the new 2016 HR-V is well worth a look. 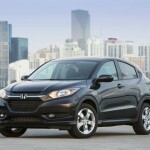 After testing most of the others in the segment, we can easily say that the 2016 Honda HR-V stands out. It has great features, is capable and looks great without being too quirky. 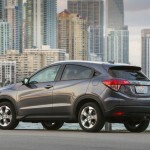 Add to that the reasonable price and Honda has a winner that should be hard to beat in the years ahead. Meanwhile we’ll still be dreaming of that shack on the North Shore. EPA interior volume: 124.4 cu.ft. 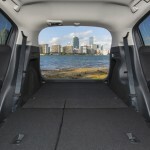 Cargo capacity, all seats in place: 24.3 cu.ft. Front head room: 39.5 in. Front hip room: 53.1 in. Front leg room: 41.2 in. Front shoulder room: 56.8 in. Rear hip room: 47.4 in. Rear leg room: 39.3 in. Rear shoulder room: 54.5 in. All specs and features can be found here.